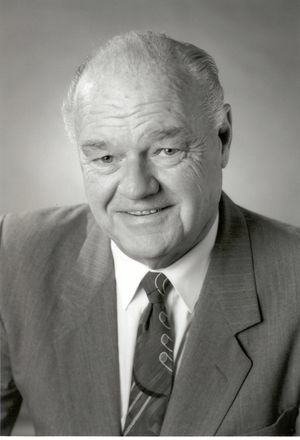 Wallace S. Read, IEEE President, 1996, was president of the Canadian Electricity Association (CEA), and also worked in the pulp and paper and hydro-electric power industries in Newfoundland, Canada. Wallace Stanley Read was born in Newfoundland, Canada and received his Bachelor of Engineering from Nova Scotia Technical College in 1951 before entering the pulp and paper and hydro-electric power industries in his native province. Between 1964 and 1984, he held senior positions with Newfoundland and Labrador Hydro and its subsidiary companies. In 1985 he joined the Canadian Electricity Association (CEA) serving as its first full time President. In that position, Read worked to promote the interests of Canadian electric utilities and the customers they serve. Upon retirement in 1995, Read formed REMAS Inc., a provider of electric power consulting services to utilities and governments. His professional affiliations include being a Life Member of the Association of Professional Engineers and Geoscientists of Newfoundland and Labrador, a Fellow of the Engineering Institute of Canada and a Life Fellow of the IEEE. He was inducted into the Canadian Academy of Engineers as a Fellow in 2001. In 1996 Read was President of the IEEE. Over the years, he has received numerous awards including IEEE's General A.G.L. McNaughton Gold Medal, the Engineering Institute of Canada 's Julian C. Smith Medal, the CEA's Distinguished Service Award, the Canadian Standards Association's John Jenkins Award, the IEEE Power Engineering Society's Power Life Award, the Canadian Council of Professional Engineers Gold Medal, the IEEE Standards Association International Award and the Charles Proteus Steinmetz Award. In addition to these honours, Doctor of Engineering Degrees (Honoris Causa) were conferred upon him by the Technical University of Nova Scotia and by Memorial University of Newfoundland. In 2003 Dr. Read was elected a Member of the Order of Canada. Througout his career Dr. Read has promoted the concept of participation in IEEE activities as an important benefit of IEEE membership. He continues to remind us that "giving" brings greater satisfaction than "receiving" in everything we do in life. An IEEE Member since 1952, he has been an active volunteer since 1965. His regional leadership roles have included Chair Newfoundland Subsection, (1976-77), Chair Eastern Canada Council, Region 7, (1979-80), Chair Region 7 (Canada) and Member of the IEEE Canadian Foundation (1986-2011). On the international level Dr. Read served ten years on the IEEE Board of Directors, as Region 7 Director (1984-85), as Secretary (1988), Treasurer (1989-90), as Vice President Standards Board (1993-94), as IEEE President Elect (1995), as IEEE President (1996) and as IEEE Past President (1997). He also served as a Member of the Power Engineering Society Board of Governors (1994-95). Coming down from the pinnacle of service as President, Dr. Read's volunteer contributions did not diminish. He became a Director of the IEEE Foundation (1998-2003), Chair of the IEEE Ethics and Member Conduct Committee (2000-01), Chair of the History Committee (2000-02), Director Emeritus of IEEE Canada (Region 7) Board (2002-11), and Chair of the IEEE History Center Trustees' Committee (2003-06). His record of service to the IEEE speaks for itself. In 2000, upon hearing that Region 7 wanted to create this new Service Award, Dr. Read endorsed the idea enthusiastically. He was quoted as saying at the time, " IEEE membership provides each of us with the opportunity to associate ourselves with our peers and to influence the growth of our Institute and the technologies we represent. Embrace the opportunity to become actively involved." This page was last edited on 8 March 2016, at 17:01.